Besides attractively showcasing your teeth, your gums protect your teeth and underlying bone from bacteria and abrasive food particles. Sometimes, though, the gums can pull back or recede from the teeth, leaving them exposed and vulnerable to damage and disease. Here are 4 things that could contribute to gum recession—and what you can do about them. Periodontal (gum) disease. This family of aggressive gum infections is by far the most common cause for recession. Triggered mainly by bacterial plaque, gum disease can cause the gums to detach and then recede from the teeth. To prevent gum disease, you should practice daily brushing and flossing and see your dentist at least twice a year to thoroughly remove plaque. And see your dentist as soon as possible for diagnosis and treatment at the first sign of red, swollen or bleeding gums. Tooth position. While a tooth normally erupts surrounded by bone, sometimes it erupts out of correct alignment and is therefore outside the bony housing and protective gum tissue. Orthodontic treatment to move teeth to better positions can correct this problem, as well as stimulate the gum tissues around the involved teeth to thicken and become more resistant to recession. Thin gum tissues. Thin gum tissues, a quality you inherit from your parents, are more susceptible to wear and tear and so more likely to recede. If you have thin gum tissues you'll need to stay on high alert for any signs of disease or problems. And you should also be mindful of our next common cause, which is…. Overaggressive hygiene. While it seems counterintuitive, brushing doesn't require a lot of "elbow grease" to remove plaque. A gentle scrubbing motion over all your tooth surfaces is usually sufficient. On the other hand, applying too much force (or brushing too often) can damage your gums over time and cause them to recede. And as we alluded to before, this is especially problematic for people with thinner gum tissues. So brush gently but thoroughly to protect your gums. Your gums aren’t just for show—they also play an important role in supporting and protecting your teeth. Healthy gums are essential for healthy teeth. Your gums can take a lot from daily chewing or other environmental factors. Unfortunately, disease or trauma can weaken their resilience. This weakening could lead to gum recession. Gum recession occurs when the tissues covering a tooth begin to lose their attachment and shrink back (recede). As a result, the tooth appears “longer” as more of it that’s normally below the gum line becomes visible. Not only is gum recession unattractive, it also exposes more of the tooth to disease-causing bacteria. The most common cause for gum recession is periodontal (gum) disease, an infection arising from the accumulation of a thin bacterial biofilm on the teeth called plaque. Infected gums become inflamed, a normal defensive response to isolate diseased or damaged tissues from the rest of the body. Chronic inflammation, however, weakens affected tissues over time and results in bone loss. Other factors can also contribute to gum recession. A tooth that didn’t erupt properly and has come in away from the center of its protective bony housing can impede adequate gum coverage. Your gum tissue thickness, which you genetically inherit, can also increase the risk of gum recession. 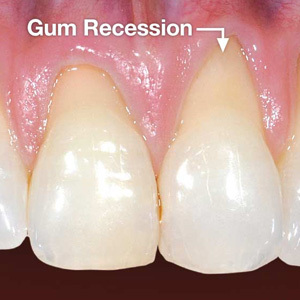 People with thinner gum tissues are more susceptible to recession than with thicker tissues. You can also damage your gums (ironically) while trying to care for them. Over-aggressive brushing over time may traumatize the gums to the point that they recede. While it’s essential in removing disease-causing dental plaque, brushing only requires a gentle scrubbing action covering all portions of tooth surfaces. The brush bristles and mild abrasives in the toothpaste do most of the work of plaque removal. To minimize the chances of gum recession, you should practice proper oral hygiene and visit your dentist regularly for professional cleanings and checkups. And you might also consider orthodontics for improperly positioned teeth that could not only improve your smile, but also your gum health. And by all means see your dentist if you notice any signs of gum infection like swollen, reddened or bleeding gums. The sooner you begin gum disease treatment, the less likely your gums will recede in the future. Gum recession is a common problem affecting millions of Americans to some degree. If you have it, you will notice that the pink gum tissue surrounding one or more of your teeth has shrunk or receded and left the tooth-root surfaces exposed. How does this happen? And does it require treatment? The answers to both of these questions will vary from person to person. The good news is that treatment is available for those who need it. The way you care for your teeth can be a major factor in gum recession. If you do not effectively remove plaque (bacterial biofilm) from your teeth daily, you may develop gum inflammation, gum disease and/or recession. Conversely, if you brush or floss too hard or for too long, you can also damage your gums. Please remember that it doesn't take a lot of pressure to remove biofilm; you just need to make sure you get to each tooth, right down to the gum line. Other causes of gum recession include: mal-positioned and/or prominent teeth that are not fully encased in supporting bone; muscle attachments (frenums) pulling at the gum line; habits such as holding foreign objects (nails, pins) between the teeth that press on the gum tissues; and badly fitting oral appliances such as dentures, braces Ã¢Â€Â“ even tongue bolts and lip piercings. Besides not looking too great, gum recession can lead to anything from minor tooth sensitivity to tooth loss in the most severe cases. If you are experiencing any discomfort from a loss of gum (also called “gingival”) tissue, we'd certainly like to know about it. We would be happy to examine your condition and make recommendations. There are surgical procedures that are very effective in treating these problems. Procedures such as gingival grafting or periodontal plastic surgery (“peri” – around; “odont” – tooth), often involve taking a small piece of healthy gingival tissue from the roof of your mouth and grafting it to the area where it is needed. Ultrafine sutures hold the graft in place until it “takes.” Laboratory-processed donor tissue can also be used. In either case, the procedure has a terrific success rate.